DIARY - presents a list of all exercise sessions by date. 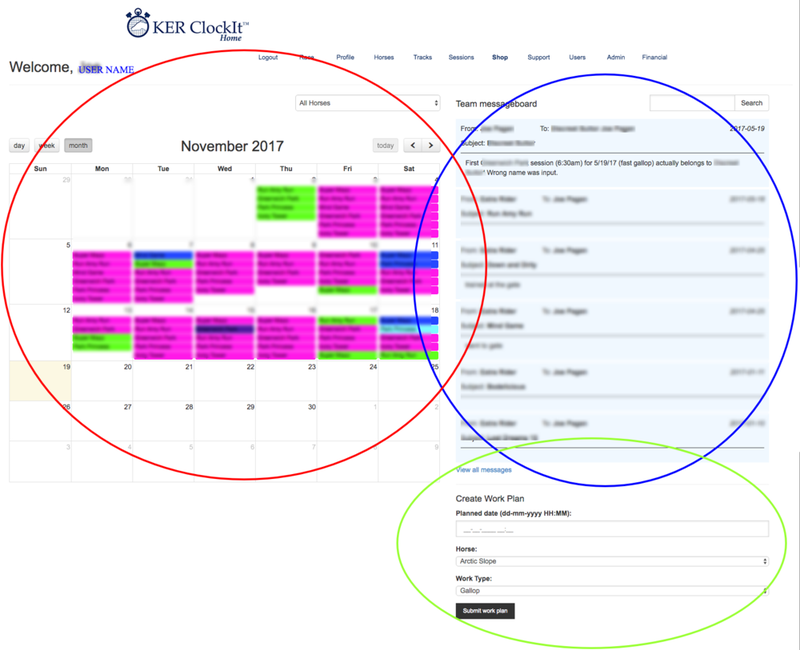 User can select to view diary by day/week/month and each entry is colour coded to reflect the WORK TYPE. User can view all horses exercised during the specified date range, or select to view a single horse from the drop down menu. Hovering over a diary entry results in a pop-out of session summary data including sectional times. MESSAGEBOARD - a user can create TEAMS of other users as communication groups. Messages are created and received using the mobile app, and are also displayed here on the website. User can search messages by horse name. WORK PLANNER - a user can create a diary entry of work sessions planned for a future date. User selects date/time, horse name and WORK TYPE. Default wok types are included but users can create and customise their own Work Types from the drop-down tab PROFILE>WORK TYPES. Satellite Image (RED) showing the track and the path followed by the horse during the session. Data Graph (BLUE) showing heart rate, speed, stride length and elevation data during the session. Sectional Data (PURPLE) shows split times, average speed and stride length for each sectional. Overall Sectional Summary (BROWN) displays the number of sectional run at each speed and the number planned in the work plan. Meteorological Data (YELLOW) displays weather data at the time the session was run. The satellite image (red highlight) shows the path which the horse followed around the track as well as details of session ID. Scrolling over the data graph (blue highlight) results in a cursor on the satellite image shows where the horse was located at the time that the specific data point was generated. At the top of the satellite image the user has the option to generate a PDF report of the session summary which can be exported. The session can also be added to TREND ANALYSIS which allows multiple sessions to be compared over time to identify trends in specified data. The main date graph (blue zone) displays speed, heart rate, elevation and stride length data for the session. Data can be presented against time or distance. The user can customise the graph choosing which measurements to display data against time elapsed or distance travelled.